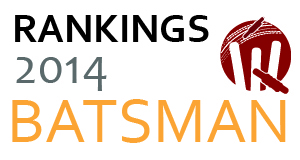 The ODI Batsmen’s Ranking 2014 is out! 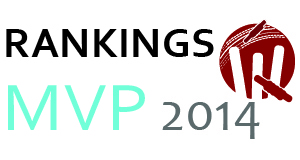 Well January is back, and so is the Ninth edition of Vineet’s Cricket Rankings (check out the ODI Batsmen Rankings 2013 here)! AB de Villiers (SA) took place of Amla and continued SA dominance at the top of the table. He claimed the top spot with 879 runs from just 16 matches with a high average of 73.25 and a strike rate of 114.45. He smashed 2 centuries and 6 half-centuries on the way to achieving this. Williamson (NZ) smashed 1 centuries and 7 half-centuries on the way compiling 770 runs in 12 matches at an astounding average of 70 and a strike rate of 87.1!! Khurran Khan (UAE) got into list for the first time and how. He scored 389 runs at an average of 83.5 and a strike rate of 85.86 to come third..
Macleod of Scotland creeped in at Number 4 with 344 runs from 7 matches. He scored at a strike rate of 100.58 at an average of 57.66 in just 7 matches. Virat Kohli continued last year’s form and was No 5 position with 1054 runs in 21 matches and an average of 58.55 and a strike rate of 99.62. He struck 4 centuries and 5 half-centuries on the way! Nasir Jamshed (Pakistan) with some wonderful batting compiled 462 runs in just 8 matches to make the list at No 4. He averaged 66 at a strikerate of 86.19 and struck 2 centuries and 2 half-centuries. He was followed by Walting (New Zealand) who scored 338 runs in 7 matches with an average of 84.5 and a strike rate of 83.04. He scored 4 half centuries on the way. But then who are the teams of 2014? Well New Zealand was best with 3 in Top 7! India is way ahead of everyone with 5 batsmen in top 30! This is much lower than it’s 2011 performance of 7 batsmen in Top 30. 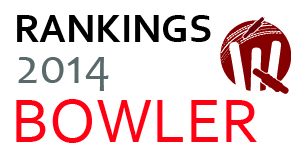 Where are the top 5 batsmen of the year 2013? We saw de Villier continue to maintain his form to the highest level. He’s made this 6 times consecutively, which makes him the most consistent Batsman of them all in the 2009-2013 period. Virat Kohli also remained in Top 5! Watch out for the next level between AB and Kohli! And the Indians? India is way ahead of everyone with 5 batsmen in top 30. Virat Kohli continued his astounding form and Rohit Sharma and Shikhar Dhawan have come up.